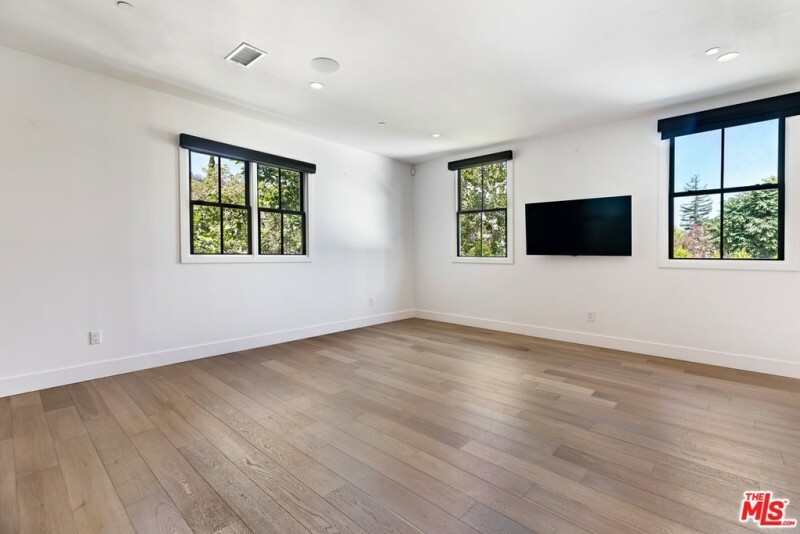 Singer Joe Jonas concluded the sale of his Sherman Oaks home this month. The musician accepted an offer of $3.7 million for the postmodern farmhouse. Which didn’t translate to a solid investment; unfortunately, the DNCE lead singer wasn’t able to make a profit after his three-year ownership of the Southern California property. The 5,600 square-footer features five bedrooms, 5.5 bathrooms, and a rustic-contemporary layout and design style that’s appealingly luxuriant. Pale hardwood floors, detailed paneling, and contemporary cues abound, as well as a luxe veneer of high-end materials. The main living space is a combination living room and kitchen complete with built-in shelving, a fireplace, and a wall of retractable glass panels leading to the backyard. Sleek and stylish, the kitchen is the centerpiece of the home with dark cabinetry, white countertops, stainless steel appliances, gold hardware, and floating shelves. The master suite is expansive and quite warm. Vaulted ceilings, a fireplace, and a sitting area offer plenty of comfort, but the massive closet and spa-like bathroom take the prize. The property exterior features a turf lawn, glistening swimming pool, and detached guest house. Jonas has been solo since the Jonas Brothers broke up in 2013. He frequently collaborates with other artists, including Jonas Blue.